Tumor cells use fatty acid rather than glucose as a fuel. The metabolic adaptation yields an insight into a novel platform for treating metastasis. The spread of cancer to a new part of the body accounts for about 90 % of cancer death. Cancer cells can spread from its birthplace to other parts of the body through either blood vessels (blood-borne metastasis) or lymphatic system (LN metastasis). By invading surrounding lymph vessels, cancer cells migrate to adjacent lymph nodes and become a colonized tumor, leading their way to other organs. If they adapt and grow in lymph nodes, the cancer cells can easily reach other organs, resulting in a worse outlook for patient’s survival. Medical oncologist Dr. Choong-kun Lee, cancer biologist Dr. Gou Young Koh, and their colleagues at the Center for Vascular Research within the Institute for Basic Science (IBS) and Korea Advanced Institute of Science and Technology (KAIST) in Daejeon, South Korea revealed a mechanism to suppress the growth and spread of cancer cells in lymph nodes, forestalling any chance for them to invade new territories of the body. The researchers used animal models with melanoma and breast cancer, which are considered to be most likely to spread first to lymph nodes. With the comparison of cancer cells grown in lymph nodes with those grown in primary site, researchers found that the metastatic cancer cells in lymph nodes boost the expression of the genes related to fatty acids broken down to produce energy, known as fatty acid oxidation (FAO). In the meantime, the cancer cells growing at primary site promote the expression of the genes involved in glucose used as an energy source (which is well-known as "Warburg" effect.) In addition, they also found that unlike other organs, lymph nodes are rich with a variety of lipids. Dr. Lee says, "These unexpected results gave me strong confidence that lymph node metastatic tumor cells preferentially use fatty acids rather than glucose as a fuel source in the lipid-rich lymph node microenvironment." He confirmed the findings with the almost complete suppression of lymph node metastasis by treating a clinically tested fatty acid oxidation inhibitor to melanoma or breast cancer-bearing mice. 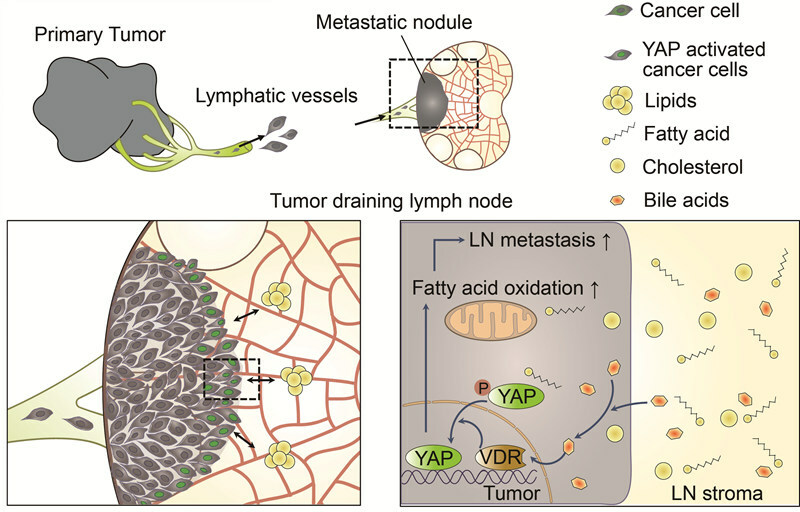 ▲ [Figure 1] Schematic diagram for the mechanism of tumor lymph node metastasisCancer cells adapt to a challenging lymph node environment through YAP-dependent adjustment to fatty acid oxidation and usage of the plentiful fatty acids as fuel. Highly accumulated bile acids are potential molecular triggers of YAP activation that act mainly through vitamin D receptor (VDR) in metastatic lymph nodes. The researchers wondered what is the intracellular signal responsible for triggering such a metabolic adaptation for the metastatic tumor cells to use fatty acid as fuel. Using extensive screening and analyses, they identified "yes-associated protein (YAP)" is a crucial driver molecule for stimulating fatty acid oxidation in the metastatic tumor cells at lymph nodes. Dr. Koh says, "We were lucky to find a link between this unusual metabolic adaptation and YAP activation in the lymph node metastatic cancer cells. YAP activation was also found in the metastatic lymph nodes of patients with melanoma." ▲ [Figure 2] (A) Stepwise growing metastatic melanoma in tumor-draining lymph node and (B) fatty acid oxidation inhibitor, Exomoxir, suppresses lymph node metastasis(A) Immunofluorescence images showing normal naïve lymph node (LN) and GFP+ tumors (green) in micro- and macro-metastatic lymph node of primary GFP+ melanoma bearing mice. The researchers conducted a comparative mRNA analysis in tumor cells growing in primary site (primary tumor) versus in micro- and macro-metastatic lymph nodes. As a result, the researchers uncovered the genes that regulate fatty acid metabolism are up-regulated in the metastatic tumor cells. (B) Comparison of metastatic lymph node between control- and etomoxir-treated groups. Metastatic melanoma (black-pigmented cells) in lymph node is rarely found in etomoxir-treated group, it is mostly found in control vehicle-treated group. To find out the major stimulator for YAP activation in lymph node metastatic tumors, the researchers looked into biological samples. They unveiled that the abundance of several bile acid species – known to be detected only in the liver and intestinal tract where they facilitate dietary fat digestion –was strikingly elevated in the lymph node metastatic melanoma. Dr. Lee emphasizes, "It was a very intriguing that bile acids are highly accumulated in the metastatic lymph node, but not in the normal healthy lymph node or primary tumor." The preliminary analyses suggest the lymph node metastatic tumor itself may produce bile acids that can activate YAP and stimulate further growth of the lymph node metastatic tumor. "It requires further extensive verification. Bile acids from blood and lymphatic circulation can be highly accumulated in lymph nodes during metastasis by a certain mechanism," Dr. Koh cautions. ▲ [Figure 3] Immunofluorescence images showing YAP activation (green) in metastatic melanoma(A) and breast cancer (B) in the tumor-draining lymph node. 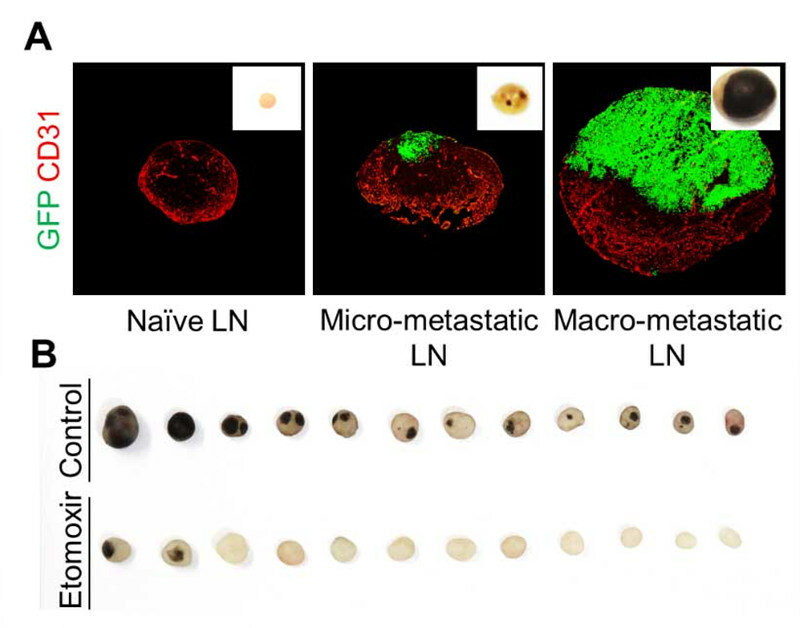 The researchers unveiled that this activated YAP is a crucial driver of tumor lymph node metastasis by stimulating fatty acid oxidation. Cancer cells are smarter than we expect in its dissemination in the body. Dr. Koh says, "This study reveals how they adapt to a challenging environment like lymph nodes by switching their energy source to locally abundant molecules such as fatty acids and bile acids to make their way to other organs." Therapies targeting FAO and YAP are currently available or being actively developed. By drawing on the link between FAO /YAP and lymph node metastasis found by this study, doctors may be able to suppress subsequent distant metastasis in patients with melanoma and breast cancers. Dr. Koh adds, "It definitely warrants more extensive investigations in patients with metastatic cancers prior to clinical applications." 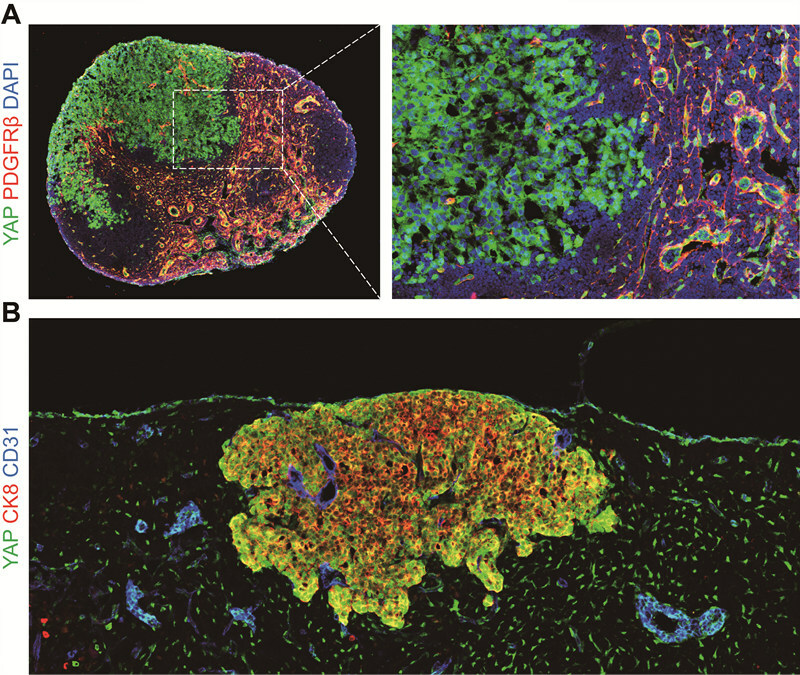 [Science Daily] How do metastatic tumor cells grow in lymph nodes? [Medicalxpress] How do metastatic tumor cells grow in lymph nodes?